German adjectives are a fundamental part of the German language. As an English-speaker you might think that adjective are not such a big deal. But you have to be conscious about what language you actually want to learn: German! And yes, nearly everything is complicated here, with lots of rules and of course… exceptions! Luckily, you have chosen language-easy.org! We will try to explain the easy and also difficult parts of German adjectives and make it a easier experience as you might think. So, let’s start right ahead! German adjectives,as well as in English, describe nouns. But, in comparison with the English language, German adjectives adapt their endings to gender and number of the noun they describe. They also change their endings depending on the case, or whether the German noun they describe has a definite or indefinite article. Let’s go into some details. When talking about German adjectives, they adapt to a mascline, feminine and neutral gender. They also adapt to the different German cases: Nominative, genitive, dative and accusative. Definite German articles are “der, die, das”, whereas indefinite articles are “ein, eine”. Well, as we have now cleared up some first basic, let us now talk about the different variations of German adjectives. And also about some examples of the most common German articles. When a German adjective takes an ending that depends on the gender and case of the noun phrase, it is called: Inflection. We also have two kinds of German articles, as we also have in English: A definite article and an indefinite article. We have “ein” and “eine”, which can basically be translated by “a” and “an”. So, let’s see how the gender of a noun influences the endings of German adjectives. Here you can see the examples with definite articles with the adjective “stark” (strong), “Mann” (man), “Frau” (woman) and “Tier” (animal). In comparison to definite articles, indefinite articles change the ending of the German adjective in a completely other way. – Whereas plural forms of indefinite articles do not exist here. Also very important when talking about German adjectives and their changing endings is the position of the adjective in the sentence. Until now, we have only seen adjectives that are positioned in front of a noun, so they are called attributive adjectives. Der starke Mann. – The strong man. Der Mann ist stark. – The man is strong. Even though the gender and number of “Mann” are the same, its position in the phrase changed its ending. Well, as you have already learned, German adjectives change their ending depending on various factors. If the article of the noun does not tell you, what gender, number or case it is: It’s the adjective’s job to do so. Unfortunately, that’s one of the rather complicated parts of German grammar. However, there are some rules for inflection that will help you to understand it’s principles. First, If there is no article at all, you have to apply strong inflection. Furthermore, it is used whenn a noun is preceded by a word or phrase like “ein bisschen“, “etwas“ or “viel“ (a little, some, much). Second, you have to use the mixed inflection when the adjective is preceded by an indefinite article (“ein-“, “kein-“) or a possessive determiner. We have already seen that when talking about indirect articles in the topic above. Third and last, you have to use the weak inflection when there is a definite word in place (“der”, “die”, “das”, “des”, “den”, “dem”, “jed-“,” jen-“, “manch-“, “dies-“, “solch-” and “welch-“). Grammatical cases can also be an important factor that can vary the ending of German adjectives. Of course, gender, number and the kind of articles have their influence, too. So, here everything just comes together! 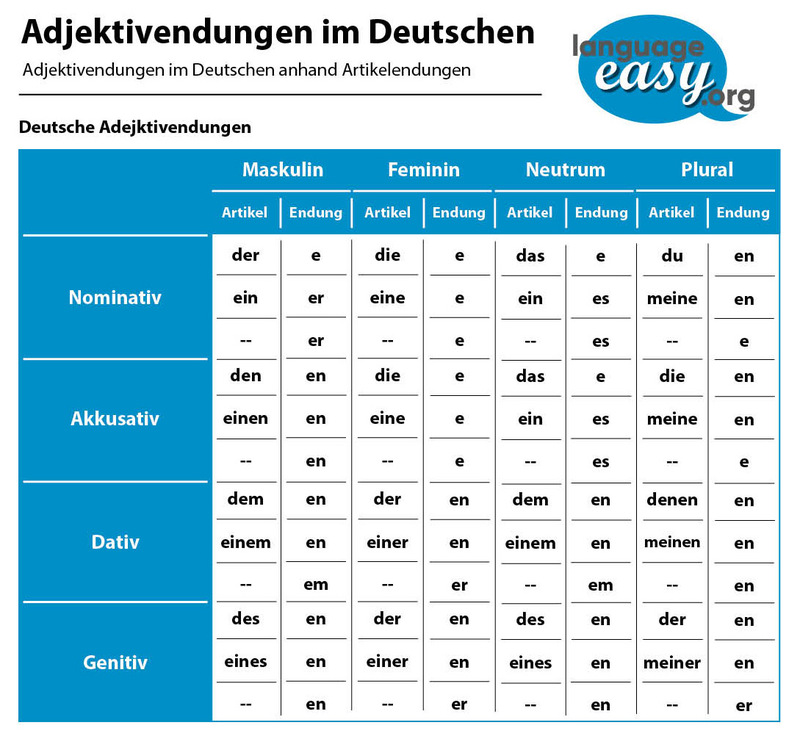 But don’t worry – in the following table you will see that there is a certain structure behind this variation of German adjective’s endings. So, there are also two grammatical forms of German adjectives that should be mentioned: The German comparative and superlative, but also the specific adjective endings you have to apply. Well, let’s have a short look at each of these elements. Please, note that there are specific articles about each one of these elements that go into more detail. Just click on the button under each topic to get redirected. In case you want to compare two things, people, thoughts, actions, qualities or what so ever, you need a German comparative. German Superlatives are used when you want to make a claim that something, relative to all others, has the most or least of a given characteristic. “Ich bin so schön wie er” – I am as pretty as he is. “Ich bin schön.” – I am pretty. In the context of German adjective endings, it is important to know that there are different endings for nouns with definite and indefinite articles, but also for nouns without an article. So, as already mentioned, you can enter this article for more detail. Last but not least I hope that you learned some now things about German adjectives and their variation of word endings. German can be hard sometimes, but, as you have seen in this article, it seems to be far more complicated as it actually is. For some additional information, I can advice you to visit this webiste. 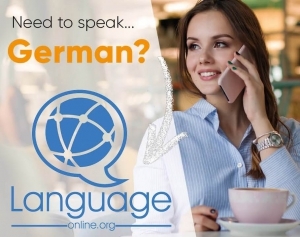 Hopefully German still fascinates as at the beginning of your studies – language-easy.org will always be happy to provide you with good information about German grammar topics! By the way, did you know that you can always stay informed about Germany? About German news and culture? Well, on the website the Deutsche Welle you can find all this information. Use the German skills you have learned already to stay in practice and enter more deeply in the world of German.